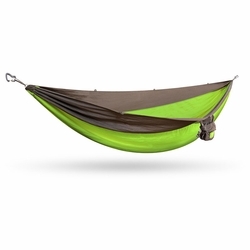 Kammok Roo V2 Hammock. The Kammok Roo™ is a high-performance camping hammock designed to provide you with an exceptional outdoor experience. Redesigned for superior comfort and an easy repacking experience, the 2017 Roo is tear resistant, incredibly comfortable, and built to last a lifetime. The Roo features triple-stitched seams at all load bearing zones for high-performance durability. Our soft, hemmed Comfort Seams™ along the sides provide a more comfortable hang. It also features eight highly durable gear loops: three multifunctional loops on either side plus two on the interior, for hanging water bottles, a Koala Underquilt™, or other gear. The integrated compression stuff sack is longer and wider for easier packing on-the-go, stronger for adventurers of all types, and features an extended roll top to carry your Python Straps (sold separately). 500 Lbs Capacity - Diamond ripstop nylon supports up to 500 lbs yet weighs less than other hammock fabrics with similar strength. 24 Ounces - The Roo is 10' tall with a 5'7" wingspan and it all packs down into a coconut-sized pouch. Room for Two - It comfortably fits two people for lounging or one person for the best night’s sleep. LUNARWAVE™ FABRIC - Kammok's custom-built LunarWave™ diamond ripstop is the only fabric designed specifically for camping hammocks. Breathable - Stay cool when it’s warm and avoid condensation when it’s cold. It’s quick- drying, too. Less Stretch - Diamond ripstop radically reduces stretch, making every hang consistently comfortable. Lightweight - Super light yet super strong, the dense weave provides superior abrasion resistance. Water & Fade Resistant - Treated with a water and fade resistant finish, the ripstop stays dry and vibrant. Hammock shelter that integrates full rainwater retention system.